On 25 November, the Russian FSB border guard ships attacked two Ukrainian artillery boats and a tugboat and, reportedly, wounded six Ukrainian sailors (Russia reported on three) and hijacked all three seacrafts. The Ukrainian National Defense and Security Council recognized the Russian attack as an act of aggression and President Petro Poroshenko supported the Council’s decision to urge the parliament, Verkhovna Rada, to impose the martial law. This is the first time since the beginning of the Russian aggression in February-March 2014 that Russia is engaging in an open act of aggression against Ukraine, not bothering to hide behind a veil of plausible deniability, like the “Donbas separatists” or “little green men without insignia” before. Landlocked by the lands of Ukraine (Donetsk, Zaporizhzhia oblasts and the Autonomous Republic of Crimea) and Russia (Rostov Oblast and Krasnodar Krai), the Azov Sea has no other access to open waters than the Kerch Strait. In fall 2017, Russia finished the construction of the bridge over the Kerch Strait to connect its Black Sea coast to the occupied Crimea. Immediately after that, Russia started hindering passage for Ukrainian and foreign ships that are calling the Ukrainian Azov Sea ports of Berdiansk and Mariupol. Two months ago two, Ukrainian Navy ships, “Donbas” and “Korets,” made their way from the Black Sea port of Odesa sailing round the Russian-occupied peninsula of Crimea via the Kerch Strait to Mariupol, planning to start creating a naval base in Berdiansk. Yesterday morning, on 25 November, the Ukrainian Navy sent a tugboat “Yany Kapu,” escorted by two artillery armored boats “Berdiansk” and “Nikopol” along the same route to Mariupol. According to the Ukrainian Navy, at 03:58 (all timestamps EET, Kyiv time) “Berdiansk” notified the coastal post of the Russian border guards service and the seaports of Kerch and Kavkaz of the intended passage via the Kerch Strait. “The information was conveyed, but no reply was given,” reads the report. 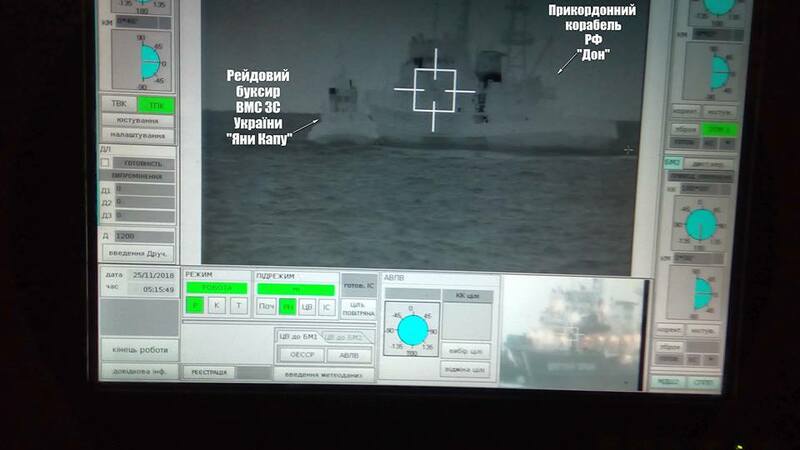 Meanwhile at 04:07 the conversation of Kerch port’s operational manager with Russian Black Sea Fleet’s warship “Suzdalets” was recorded regarding finding the Ukrainian ships. At the same time, the port managers of Kerch and Kavkaz didn’t reply to calls of the Ukrainian Navy ships. The Navy reported at 09:04 that the Russian border guard ship “Don” rammed into “Yany Kapu,” damaging its main engine, hull, and guard railing. Russian Mangust and Sobol type boats, border guards ships Suzdalets and Don participated in the attack. “Like pirates!” commented Andriy Shevchenko, the Ukrainian Ambassador to Canada. Ukrainian Minister of Interior Arsen Avakov stated that the video was discovered remotely by the Ministry using special equipment. As Ukrainian ships approached the Kerch Bridge, Russia blocked the passage under the main arch with a tank vessel and told that it had run aground. However, it wasn’t an obstacle for Russia to move it aside for several minutes to let its several ships pass northwards, and close the passage again. Additionally, Russia deployed several more seacrafts, as well as K-52 combat helicopters, and even Su-25 fighter jets in the Kerch Bridge area. After the blockage, Ukrainian ships headed back to Odesa, but shortly after they crossed the 12-nautical-mile baseline and reached neutral waters, the Russian ships opened fire on Ukrainian seacrafts wounding at least one sailor, reported the Ukrainian Navy as of 20:33. Further reports from different sources mention 2-6 wounded Ukrainian servicemen. Later the Ukrainian Navy reported that following the live-fire attack two of the vessels, Yany Kapu tugboat and Berdiansk armored boat, lost engines and were seized by Russian special forces. They were towed by Russian tugboats. The third seacraft, Nikopol, was surrounded by Russian ships and forced to follow their course. 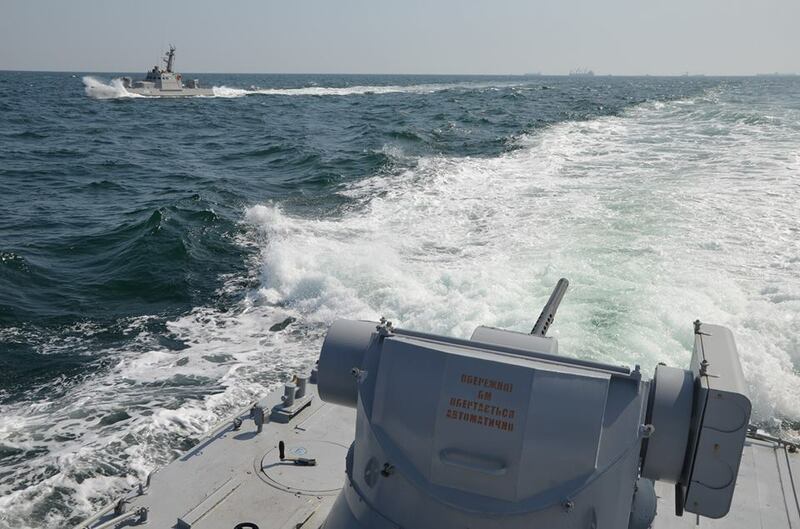 According to Navy Commander Ihor Voronchenko, the Ukrainian immobilized tugboat and two armored boats were pursued by approximately ten Russian ships of different classes: two ships of the Black Sea fleet, two cutters of the Black Sea fleet, and the rest were cutters of the FSB. He said that radio talks show that “Berdiansk” captain stated he was not undertaking any illegal acts was leaving into the open sea, but the Russian Navy answered with a salvo of the 30-mm gun of the Russian “Izumrud” followed by use of lethal force. In result, the captain and two crew members were wounded by shrapnel. Since Russia believes that the Crimea it had annexed and its territorial waters had become Russian, it blamed Ukraine of a Russian border violation. Russian FM Sergey Lavrov even claims that Ukraine has “deliberately provoked an incident in the Kerch Strait” near in order to create a pretext for new sanctions to be imposed on Moscow. Meanwhile, Ukrainian ships operated in domestic territorial waters and the annexation of Crimea hasn’t been internationally recognized. Chief of the General Staff Viktor Muzhenko informed the NSDC meeting that 23 servicemen were aboard the three Ukrainian vessels. Preliminary, six of them were wounded in the Russian attack, two of them were in serious condition. All 23 were taken captive by the Russian forces. Meanwhile, Russian media reported this morning that three Ukrainian sailors were in a hospital. President Petro Poroshenko convened a closed meeting of the Military Cabinet of the Ukrainian National Security and Defense Council (NSDC) at 22:00 and later an open meeting of the NSDC at 00:00. Following the NSDC midnight meeting, Council’s secretary Oleksandr Turchynov told that NSDC unanimously supported the proposition to impose martial law in Ukraine for 60 days. According to Turchynov, Ukraine qualifies Russian actions in the Sea of Azov as an act of aggression. President Poroshenko supported the decision and instructed to submit it for consideration of the parliament. The suggestion on the introduction of martial law now needs to be considered by the Verkhovna Rada (Ukraine’s Parliament). The extraordinary parliamentary meeting on that is to take place on November 26 or 27 behind the closed doors. As President Poroshenko said at the meeting, imposing martial law does not imply declaring war or holding offensive operations, but it’s intended at defending the Ukrainian territory. He stressed that no full mobilization will take place, constitutional rights and civil freedoms of the citizens will not be limited, Ukraine won’t give up its efforts for the peaceful resolution of the conflict with Russia in the Donbas, mentioning the Minsk Agreements. Rada speaker Andriy Parubiy announced the closed session of the parliament on 26 November at 16:00. The Armed Forces of Ukraine have been brought to full combat readiness. Ukrainian Mission to UN requested an urgent UN Security Council meeting due to Russian military aggression in the Black Sea and the Sea of Azov. Russia did the same, accusing Ukraine of violating what Russia believes to be its territorial waters. The meeting was scheduled to 18:00 EET (11:00 EST). Hours before the fire attack and assault on Ukrainian vessels, Lithuanian Foreign Minister Linas Linkevichus “strongly condemned” Russia’s blocking the Kerch Strait and ramming the Ukrainian tugboat, calling the latter an act of aggression. Estonia condemned the Russian attack on Ukrainian vessels and called on the immediate release of the seized ships. Latvian Foreign Minister Edgars Rinkēvičs said the attack against the Ukrainian Navy should be condemned by the international community. #Ukraine has the right to use this international waterway. Blocking them is an unlawful, hostile action by the Russians against Ukraine and the US should join the international community in condemning it. And US Congressman Brian Fitzpatrick, co-chair of the Congressional Ukraine Caucus, said, “Russia must immediately restore the freedom of navigation through the Kerch Strait to allow Ukrainian vessels to freely use Ukrainian ports,” in his statement.